CarGurus has 25,626 nationwide Jetta listings starting at $995. For the last year of its sixth generation, Volkswagen slims the Jetta's trims, expands available safety systems, and makes a reversing camera standard. 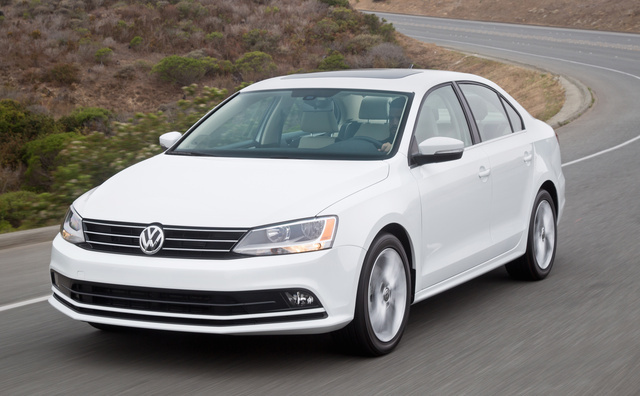 While Europe got a new Jetta in 2015, the U.S. has seen the same old model since 2011. That’s a long time for a single generation of vehicle, and Volkswagen has dealt with its own internal issues during that time. For 2018, the Jetta gets a break as it prepares for the debut of its seventh generation in 2019, but rather than letting the sixth fade into obscurity, VW has presented a mild shakeup in 2017 in the form of a reduction of trim levels, a redistribution of standard and optional safety features, and the inclusion of a standard reversing camera on all trims. With classic compact styling, a tight, balanced chassis, and a torquey little turbo engine, the Jetta offers much more than its borderline banal styling would suggest. Aged as it is, it’s suffered through style criticism for years, as the competition enters increasingly ostentatious territory inside and out. 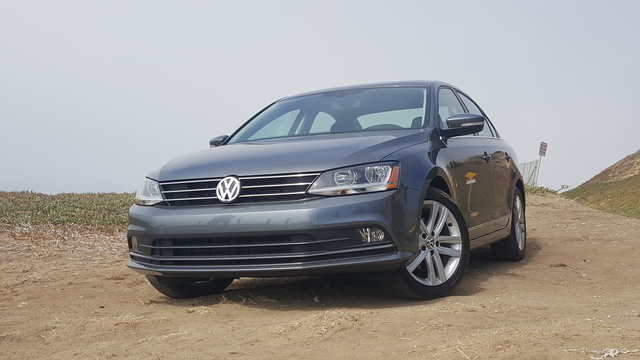 Still, there’s a place for reserved, classy lines and competent performance that takes more than numbers on paper into consideration, and the Jetta delivers just that. Starting at an attractive entry price of $17,895, the S trim has some surprising features—both good and bad. LED daytime running lights, fog lights, heated side mirrors, and a reversing camera are surprise standards here, not usually found on base trims and certainly not ones that sell for less than 18 grand. Tack on air conditioning, cruise, a tilt and telescoping steering wheel, and full power accessories, and you’ll be considering whether “base” needs a new definition. But don’t be fooled—there are things waiting to remind you this is the entry level. 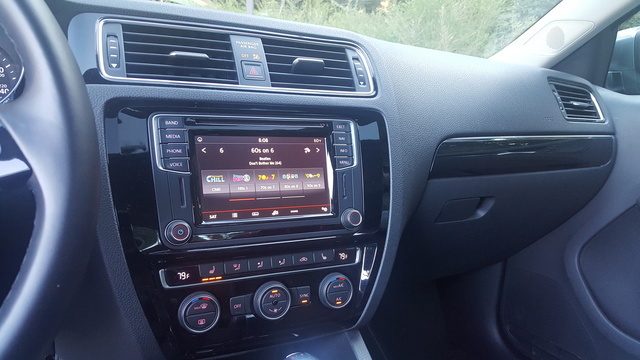 The Jetta's 16-inch steel wheels, lackluster 4-speaker stereo, and a 5-inch touchscreen should all be pain points, but a Cold Weather Package ($395) for heated seats and washer nozzles and an alloy wheel upgrade ($300) should alleviate some of the suffering. The SE curiously deletes the fog lights but takes all the features listed above, including options, and sweetens the deal with pleather for the seats, steering wheel, and shifter; keyless entry and ignition; a sunroof; and a better 6.3-inch touchscreen system with satellite and HD Radio and VW App-Connect. This means you’ll also get Apple CarPlay and Android Auto, a game-changer for a lot of buyers. Additionally, the SE adds blind-spot monitoring with rear cross-traffic alert, two nice features for its $20,895 starting price. One final curious bit of configuration: The SE adds rear-seat access to the trunk, a feature strangely absent from the S trim. Additionally, these trims come standard with a manual transmission—an automatic will cost another $1,000. A curious entrant in this lineup is the Sport trim, taking the features of the S and adding the 1.8-liter engine, a sport suspension and rear spoiler, plus heated seats, navigation, and VW App-Connect with the larger touchscreen, 17-inch alloys, push-button start, and unique leather upholstery. You can add a $995 Lighting Package for Bi-Xenon HID adaptive headlights and reflector halogen fogs, but the Sport offers no advanced safety systems, no sunroof, and no climate control or even keyless entry. It’s a unique trim that I’m not sure hits all the right points for $22,175. Add the 2.0-liter engine, upgraded transmissions, and an adaptive suspension option, and I think you'd have a winner. If fog lights are important to you, the SEL tosses them back into the mix and upgrades the base 1.4-liter engine to a 1.8 that adds another 20 hp. Here you’ll get a more upscale list of safety and luxury features, including a forward-collision warning system with auto braking, adaptive cruise, navigation, an upgraded 6-speaker stereo, rain-sensing wipers, a power driver’s seat, and dual-zone auto climate control. There are some subtle chrome trim additions outside, and inside you get upgraded materials and the debatable utility of a cooled glovebox, all for $24,995. With a 2.0-liter turbocharged engine, the GLI tries hard to inject some extra performance into the Jetta lineup. Why the Sport trim doesn’t get the 2.0 as well, I’m not sure, but here you’ll enjoy a seriously peppy little pumper, with serious upgrades inside and out as well. What’s shocking is that the GLI deletes features like the forward-collision warning system with auto brake and adaptive cruise, systems quickly becoming expected, especially with a top-tier trim starting at $27,895. To justify the price, the GLI also comes with a sport suspension and sport seats, 18-inch alloys, upgraded brakes, parking sensors front and rear, a 9-speaker Fender stereo, and unique aesthetic upgrades outside like a new grille, rear spoiler, chrome exhaust tips, and LED tails. 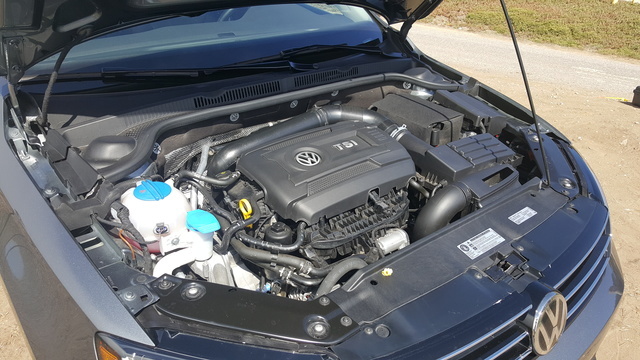 Volkswagen’s 1.4-liter turbo has impressed me. It’s peppy, torquey, easily achieves its advertised efficiency numbers of 28 mpg city, 38 highway, 32 combined, and even manages to sound relatively good while doing it. This is what I want out of an “economy” engine, and VW has delivered. Too many small, turbocharged engines have ambitious economy numbers that can be achieved only if you drive with a quarter throttle on a flat surface, meaning you'll never get high enough in the powerband to reach their advertised power numbers. Allow the engine to spool high enough to reach peak power, and your economy is shattered. Not here. With 150 hp and an impressive 184 lb-ft of torque available nearly right off idle, the 1.4 can push the Jetta to 60 mph in a little over 7 and a half seconds. This places it advantageously with respect to the competition, but looking beyond 0-60, there’s a slight issue with passing power. Accelerating from 50-70 mph takes significantly longer than all competitors, and while I’ve never felt the 1.4 performing sluggishly, it’s a comparison I urge you to make during your own test drives. Combating this problem is the 1.8-liter engine, which upgrades horsepower to 170 and suffers an economic penalty placing it at 25 mpg city, 35 highway, 29 combined. That extra 20 hp is definitely felt as the revs build, but 3 mpg in every category is a strong price to pay. Finally the 2.0 offers a stout 210 hp and 207 lb-ft of torque with nearly zero lag. A 6-speed manual transmission comes standard here, though the 6-speed, dual-clutch DSG is an option. Fuel economy drops even further, even with the advantages of the DSG, scoring 27 mpg city, 33 highway, 27 combined. Go with the manual and you’ll lose another mpg around town. Handling falls short of invigorating, but the stock suspension delivers more than adequate feedback without falling to pieces over the first bumps you encounter. With a balanced, tight chassis, it’s everything I’d want out of a compact sedan that has no sport pretensions. Upgrade to the stiffer suspension of the Sport or the GLI and you can have a bit more fun, but I’d really like to see an adaptive option here. More importantly, braking is above average for the class, taking just 118 feet to come to a stop from 60 mph with the stock brakes. Aesthetic preferences aside, the classic styling of the Jetta is eclipsed by more important factors. While people continue to complain that this isn’t the European Jetta, you’re still getting the build quality that made German cars famous. Closing a door should close the case here, with a satisfying sound that seems increasingly rare as sheetmetal continues to thin. The suspension has similar characteristics, and its operation is solid and confidence inspiring. The Jetta has additionally been critiqued for using cut-rate materials inside. 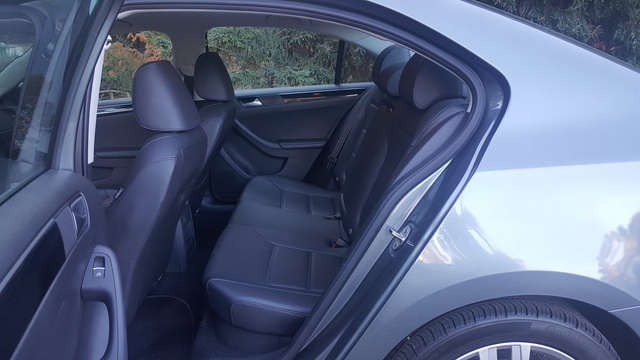 While lower trims are certainly plagued by an excess of hard plastics, the SEL’s upgrades inside present a pleasant place in which to pass the miles. Still, some additional improvements would be welcome even here, and I hope the seventh generation addresses this even in the lower trims. Where you won’t be disappointed is with regard to space. At 6-foot-4 I had more head- and legroom than I could use up front and could even fit in the back without having to adjust the driver’s seat. You’ll struggle to find any compact that can match it. 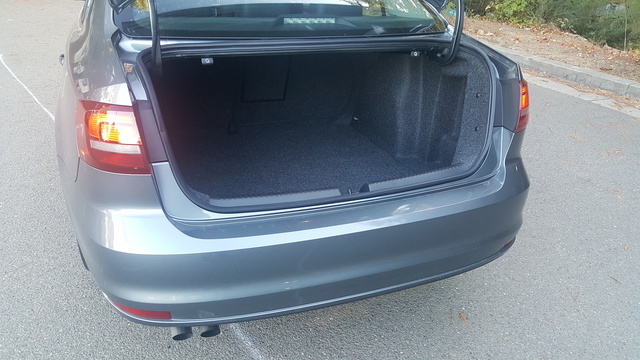 Even better is the trunk, where 15.5 cubic feet lines up more comparably with midsize offerings than compacts. Technology got the biggest upgrade for 2017, with a reversing camera made standard and safety features like blind-spot monitoring with rear cross-traffic alert showing up early in the trim lineup. Additionally, VW App-Connect with Apple CarPlay and Android Auto support now showing up on every trim above the base S means a huge tech improvement. With standard LED running lights, keyless entry, and cruise also standard in the S, and heated seats and washer nozzles available as options, the Jetta starts positioned quite well. Additional upgrades with the SE beyond the infotainment system, like push-button start and the aforementioned BSM with rear cross-traffic alert, represent a hell of a deal at $20,895, but it’s the SEL’s full suite of adaptive cruise, forward-collision warning with auto braking, rain-sensing wipers, dual-zone auto climate control, and navigation that make it the best overall deal in the trim lineup. Sadly, the GLI does little to improve on tech beyond adding parking sensors front and rear and LED taillights, while strangely omitting the adaptive cruise and forward-collision warning system with auto braking. When you start with a 5-star safety rating and above-average braking for the class, you know you’re in a good place. In fact, only the total front impact tests from the National Highway Traffic Safety Administration (NHTSA) garnered less than a perfect score with a 4-out-of-5-star rating. The independent Insurance Institute for Highway Safety (IIHS) also awarded the Jetta top marks. The Jetta's 118-foot braking distance from 60 mph even in base trims is exactly what I want to see out of a compact sedan. That figure is tops in the segment, though I’m sure VW can do even better. And if you go with the upgraded brakes of the higher trims, things will only improve. When choosing your trim, keep in mind that the Sport trim deletes all advanced safety systems, and while the GLI adds parking sensors, it deletes adaptive cruise and the forward-collision warning system. 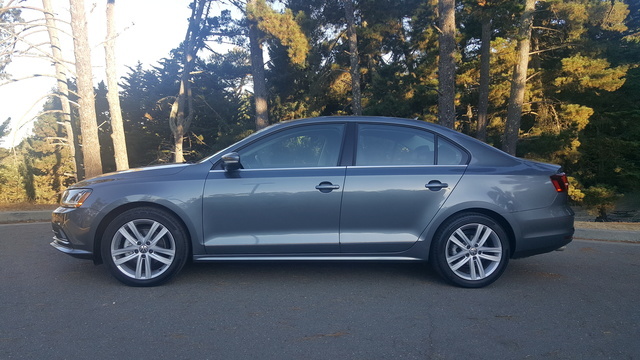 The Jetta spans the economic crevasse, going from an impressive deal to overpriced. At the S and SE trim levels, you’ll get a hell of a lot of car with some surprising options for 20 grand. The SEL is liberally peppered with content, though its price seems to catch up a bit. You’ll be left with a good deal rather than a really good deal. The GLI is hard to justify, however. While it offers an incredible engine, two fun transmission choices, upgraded brakes, and a sport suspension as well as its list of luxury features, the omission of the forward-collision warning system and adaptive cruise at its $27,895 price makes it a less-attractive option. One argument against the 2017 Jetta is the fact that VW has just extended its warranty for all 2018 models to 6 years and 72,000 miles, double what is offered in 2017 and nearly the most extensive in the industry. If you’ve absolutely fallen in love with the sixth-generation Jetta, this is the best one yet. Otherwise, I’d wait to see what the seventh generation offers in 2019. What's your take on the 2017 Volkswagen Jetta? TheHorror VW needs to bring the Jetta to the MQB platform, soon. Users ranked 2017 Volkswagen Jetta against other cars which they drove/owned. Each ranking was based on 9 categories. Here is the summary of top rankings. Have you driven a 2017 Volkswagen Jetta? I took my battery out to start another car , when I put it back in it started fine but gave me a steering wheel malfunction light, anyone have a idea why or how I can fix it?